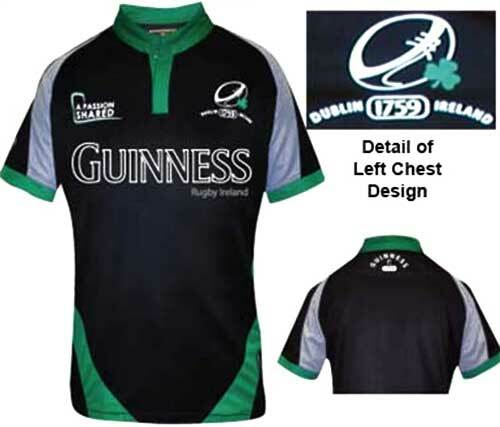 This Guinness rugby shirt features DUBLIN 1759 IRELAND along with a rugby ball and a green shamrock on the left chest; additionally, A PASSION SHARED is printed on the right chest with the words Guinness World Rugby printed across the front. The jersey is further enhanced with the famous Arthur Guinness signature printed on the right sleeve along with GUINNESS 1759, the year the brewery opened, and a pint just below the collar on the back. The Guinness world rugby shirt is a black jersey with green accenting and grey trim. The short sleeve rugby jersey features a breathable fabric with sweat absorption and quick dry fibers and it is enhanced with green and white print along with concealed rubber buttons. The Guinness rugby shirt is available at The Irish Gift House in sizes medium through 3XL.